These decorative Slings will last a lifetime, and can be personalized with what ever name you want. They are equipped with Quick Connect Swivel Hooks for easy on and off attachment. They also came with a buckle that allows for about 6" of adjustment, but can be made without buckle if you so choose (just secify at checkout). Like all of our products they are made from the same 10 oz. leather. 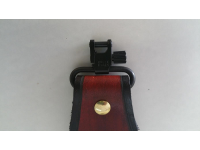 This sling comes with an Iron Cross logo all the way through, and can be customized with whatever na..
Top quality custom leather rifle sling, made with the same 10 oz. leather as all of our products. Ma..
Top quality custom leather rifle sling, made with the same 10 oz. leather as all of our products. Cu..